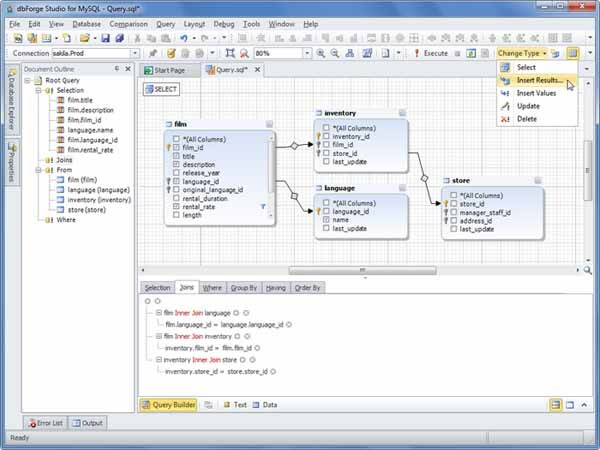 Free download dbForge Studio for MySQL latest version. dbForge Studio is a universal MySQL client for Windows that enables MySQL developers and administrators to create and execute queries, develop and debug MySQL routines, automate MySQL database object management in the convenient environment, and many others. Fill MySQL databases with external data using our export and import tools. They support more than 10 popular data formats and allow customizing the whole process. Templates, automating data import and data export tasks through command line are also available. Dump databases in SQL format and schedule regular MySQL database backups. Use 5 levels of file compression and wide set of options to fine-tune backups. Save your settings and connections as a project for the next time or to use in the command line. There are much more features that you can find on the official website.